Lance Armstrong's mother was 17 when she gave birth. His father abandoned them when he was two, and Armstrong has never seen him since. When reporters ask, he refers to his natural father as "the DNA donor". Lance started as a triathlete, the sport where competitors swim, cycle and run. He was good in the water and fast on his feet, but cycling was Armstrong's strength, and he soon decided to concentrate on cycling competitions. He won the US amateur cycling championship in 1991, and turned professional the following year. In 1996 Lance Armstrong was diagnosed with testicular cancer, which had already spread to his brain and lungs, and doctors told him he had a 50/50 chance of surviving. Armstrong underwent surgery, received high-dose chemotherapy, and eventually recovered. His doctors then told him the 50/50 line had been a little white lie -- his actual odds of survival had been much worse, but they did not want to get his spirits down. 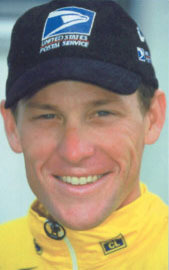 In 1997, Armstrong began cycling again, and established the Lance Armstrong Foundation. The Foundation provides education and advocacy for cancer patients, and funds cancer research. In 1999, he qualified for cycling's most prestigious race, the Tour de France -- a huge one-lap race around all of France, broken into 20 stages plus a short prologue. The race's flat stages eventually give way to steep mountains, which separate the winner from the also-rans. The total distance is more than 2,000 miles, and it is incredibly grueling. Armstrong won the Tour de France seven times consecutively, from 1999 through 2005, before having his victories stripped away by the International Cycling Union in 2012. In August 2005, Jean-Marie Leblanc, director of the Tour de France, said that Armstrong owes the world an explanation after French newspaper L'Equipe reported that erythropoietin ("EPO"), a performance-enhancing drug, had been found in Armstrong's stored blood sample from 1999. But Armstrong emphatically denied taking performance-enhancing drugs,, even as ex-teammates spoke of "secret code words, clandestine phone lines and furtive conversations" regarding human growth hormone. On 24 August 2012, US Anti-Doping Agency determined that Armstrong had used banned substances and erased his cycling titles, and further banned him for life from the sport. In a 2013 interview with Oprah Winfrey, Armstrong finally admitted using performance-enhancing drugs during his years of cycling victories. See "Lance Denies 'Credible' Report He Used Steroids", Associated Press, 23 August 2005, and Dale Robertson, "Lance Responds Angrily to Tour Director's Reaction", Houston Chronicle, 25 August 2005, a physician comments on the reliability of testing such old samples: "We are extremely surprised that urine samples could have been tested in 2004 and revealed the presence of EPO, Dr. Christiane Ayotte of the Institut National de la Recherché Scientifique told VeloNews. In its natural state or the synthesized version it's not stable in urine, even if stored at minus 20 degrees."